PORTLAND, Oregon, July 30, 2015 (ENS) – Greenpeace activists who rappelled from the St. John’s Bridge in Portland and hung there overnight, today blocked Shell Oil’s Arctic drilling support icebreaker, the MSV Fennica, as it attempted to leave dry dock early this morning. 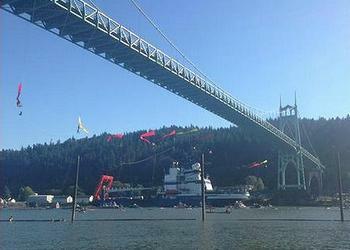 At about 6:30am local time, the 380-foot long icebreaker approached the St. John’s Bridge across the Willamette River and moved toward the bridge where the activists were suspended, but the ship turned back at about 8:00 am and returned to dry dock. The Fennica had sailed from Alaska to Portland for repairs after sustaining a three foot gash in its hull as it left Dutch Harbor July 7 headed for the drill site. The activists, who had hung from the bridge since Wednesday at 3 am local time flying bright-colored banners, were jubilant, feeling that they had won a victory in their fight against an Arctic oil rush that they fear will accelerate climate change. But at about 6 pm Thursday, the Fennica again approached the bridge, passed through gaps between the protesters dangling about 100 feet above the river and sailed toward the ocean. The Obama Administration has granted permits for Shell to drill the first offshore oil wells in the Arctic. But the activists fear that if Shell drilling operations spill oil in the icy waters of the Chukchi Sea off Wainright, Alaska, there would be no way to clean it up. In an environmental analysis conducted during the permit process, the Bureau of Ocean Energy Management predicted a 75 percent chance of a major oil spill if Shell develops its Chukchi Sea leases. 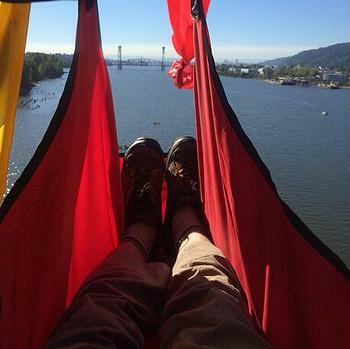 With this in mind, throughout the day Thursday the 13 climbers remained suspended below the St. John’s Bridge, along with 13 more activists on the bridge providing support and dozens of kayakers on the river below. Meanwhile in Anchorage, Alaska, Shell went to court in an attempt to get Greenpeace to remove the demonstrators. The oil company was successful. U.S. District Court Judge Sharon Gleason ruled Thursday that Greenpeace was in civil contempt of court because the protesters dangling off the bridge were impeding the vessel. She ordered the environmental group to pay a fine of $2,500 for every hour that protesters continued to block the Fennica from passing. All demonstrators are now down off the bridge and the Fennica is headed for Alaska, but environmentalists vow to fight on. Police arrested two Greenpeacers. The U.S. Coast Guard cited 13 protesters for entering established safety zones around the ship. The recommended fine for each citation is $500, but the Coast Guard could seek up to $40,000 for each violation. Each person will have the chance to refute their fines to hearing officers, Coast Guard officials said.